Recent action taken by the Ohio Environmental Protection Agency (Ohio EPA) could lead to more restrictive legislation governing phosphorous levels from Wastewater Treatment Plants (WWTPs) around Ohio. In late 2017, the Ohio EPA submitted a Domestic Action Plan (DAP) to the U.S. Environmental Protection Agency (U.S. EPA) for its review. The primary goal of the DAP is to reduce the amount of total and dissolved reactive phosphorous entering Lake Erie each year, culminating in a 40 percent total spring load reduction in phosphorous levels by 2025. Heightened phosphorous levels have contributed to an increasing number of algal blooms since the mid-1990s, leading to detrimental effects on the Lake Erie watershed and surrounding areas. The majority of phosphorous runoff comes from non-point sources (shown in the chart below). Approximately 9 percent of the phosphorous entering the Maumee River watershed originates from various treatment or industrial plants with a National Pollution Discharge Elimination System (NPDES) permit. 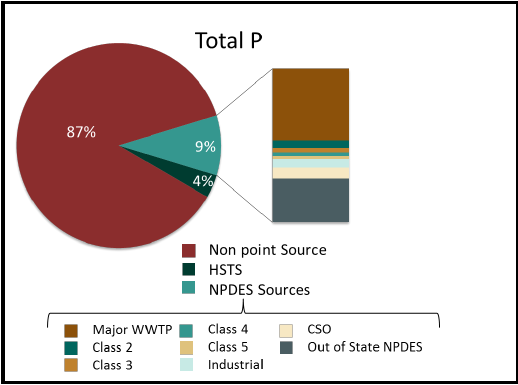 Phosphorous from NPDES sources is further broken up, with major WWTPs contributing a sizable portion of the total phosphorous levels from NPDES sources. If the U.S. EPA approves the Ohio EPA’s action plan, and the Ohio EPA decides to pursue legislation further limiting phosphorous discharges, WWTPs throughout the state may need to implement additional phosphorous treatment measures to meet the proposed stricter discharge guidelines. Such measures would likely result in significant costs to the WWTPs affected, and WWTPs would be wise to begin researching options sooner rather than later. It is important to note that since the Ohio EPA does not currently have the statutory authority to require such phosphorous limits, the Ohio legislature must pass legislation to statutorily mandate the proposed phosphorous limits. Any subsequent change in Ohio law will take time to achieve, and any WWTPs or other entities that may be affected by the DAP will have additional warnings of potential changes in the law before any stricter guidelines are implemented.